The Oswego Fire Protection District is located approximately 40 miles southwest of Chicago. Learn More About the District. Study the beginnings of the Oswego Fire Protection District. 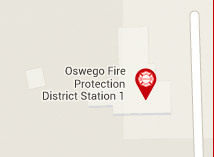 The Oswego Fire Protection District currently has four stations in use throughout the area. Locate the nearest fire station. We offer comprehensive CPR classes to those who work or reside within the district. Register or Browse Class Schedule. Get informed on the district fire prevention codes and ordinances. Check out some of the photos we've taken from various community events and activities. Browse our Photo Gallery.